A Saturn V Third Stage (S-IVB) Fuel Tank Relief Valve utilized in conjunction with the Liquid Hydrogen (LH2) Cryogenic storage tank and propellant distribution system; manufactured by subcontractor W.O. Leonard Inc (Pasadena, California) un behalf of Douglas Aircraft Company (Prime S-IVB) for NASA contract NAS7-101. 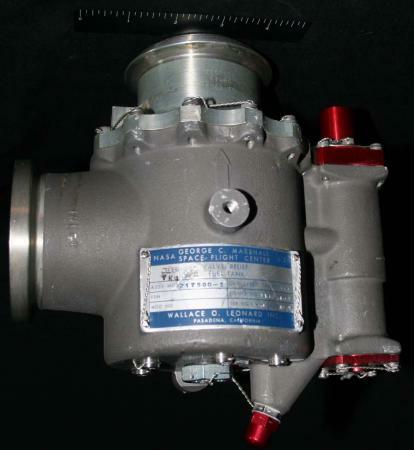 This component was part of the vent and relief system capable of relieving all excess pressure accumulated from over-pressurization or fuel boil-off during fill and flight operation.